This article is about the street in Dunedin, New Zealand. For Baldwin Street in Toronto, see Baldwin Village. A woman descends the street. 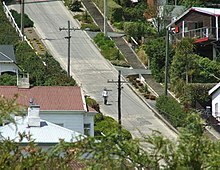 Baldwin Street, in Dunedin, New Zealand is the world's steepest residential street, according to Guinness World Records. It is located in the residential suburb of North East Valley, 3.5 kilometres (2.2 mi) northeast of Dunedin's central business district. A short straight street a little under 350 metres (1,150 ft) long, Baldwin Street runs east from the valley of the Lindsay Creek up the side of Signal Hill towards Opoho, rising from 30 m (98 ft) above sea level at its junction with North Road to 100 m (330 ft) above sea level at the top, an average slope of slightly more than 1:5. Its lower reaches are only moderately steep, and the surface is asphalt, but the upper reaches of this cul-de-sac are far steeper and surfaced in concrete (200 m or 660 ft long) for ease of maintenance (bitumen—in either chip seal or asphalt—would flow down the slope on a warm day) and for safety in Dunedin's frosty winters. The 161.2-metre-long (529 ft) top section climbs 47.2 metres (155 ft) vertically, an average gradient of 1:3.41. At its maximum, about 70 metres (230 ft) from the top, the slope of Baldwin Street is about 1:2.86 (19° or 35%). That is, for every 2.86 metres travelled horizontally, the elevation changes by 1 metre. The street's steepness was unintentional. As with many other parts of early Dunedin, and indeed New Zealand, streets were laid out in a grid pattern with no consideration for the terrain, usually by planners in London. In the case of Baldwin Street (and much of the Dunedin street plan), the layout was surveyed by Charles Kettle in the mid-19th century. The street is named after William Baldwin, an Otago Provincial Councillor and newspaper founder, who subdivided the area. For cars it is a cul-de-sac, but Baldwin Street is linked across the top by Buchanan Street, a footpath following an otherwise unformed (i.e. unpaved) road linking it with Calder Avenue and Arnold Street, which are unformed in their upper reaches where Baldwin is steepest. The streets running parallel to Baldwin are all quite steep: Arnold Street (1:3.6), Dalmeny Street (1:3.7), and Calder Avenue (1:5.4). The unicyclist has to lean forward to keep his centre of gravity centred over his unicycle's contact with Baldwin Street, on the steeper cement covered portion of the street. In March 2001, a 19-year-old University of Otago student was killed when she and another student attempted to travel down the street inside a wheelie bin. The bin collided with a parked trailer, killing her instantly, and causing serious head injuries for the other student. Since 2002, a further charity event has been held annually in July, which involves the rolling of over 30,000 Jaffas (spherical confectionery-coated chocolate confectionery). Each Jaffa is sponsored by one person, with prizes to the winner and funds raised going to charity. This event follows a tradition started in 1998, when 2,000 tennis balls were released in a sponsored event raising money for Habitat for Humanity. On 2 January 2010, Cardrona stuntman Ian Soanes rode down Baldwin Street on a motorcycle on one wheel. On 26 January 2018, 11 year-old Harry Willis raised over $11,000 NZD for the Ronald McDonald House in Christchurch by ascending the street on a pogo stick. The climb took around ten minutes. Willis's effort has since been commemorated with a plaque at the top of the street. On 10 January 2019, a man rode a Lime scooter down Baldwin St, the same day that the scooters had been introduced to Dunedin and a week after Dunedin's mayor, Dave Cull, had said he was relying "on people's common sense" not to take the scooters down the world's steepest street. Baldwin Street's claim to fame has caused some controversy after it emerged that the original entry in the Guinness Book of Records was based on a typographical error, claiming a maximum gradient of 1:1.266 (38° or 79%). This appears to be an error for 1:2.66, which itself is slightly steeper than the currently accepted figure of 1:2.86. Alternatively, the mistake may have been caused by confusion between grade in degrees and percentage grade, mixing up 38% with 38°. Nevertheless, Guinness officially recognises Baldwin Street as the world's steepest street at a 35% grade. A street in Stilfs in South Tyrol (Italy) has a 40% gradient as indicated by the street sign. This is a residential street and a cul-de-sac. The Côte St-Ange in Chicoutimi, Quebec, Canada with an alleged 33% gradient (about 18°). However this again appears to be down to confusion between slope angle and percentage grade; the street is signed as having an 18% grade. Canton Avenue, in Pittsburgh, Pennsylvania, United States; it is officially measured to be a 37% grade. However, that angle of 37% only extends about 6.5 metres, whereas Baldwin Street's steepest part stretches considerably farther. Eldred Street in Los Angeles, United States; one of three streets in Los Angeles between 32% and 33.3%,. Filbert and 22nd Streets in San Francisco, California, United States each have 31 to 31.5% (17°) for 60–70 metres. Several short pieces of San Francisco streets are steeper, including a 9-metre section of Bradford street paved in 2010 that averages 39–40% grade. Waipio Valley Road (20°7′11″N 155°35′36″W﻿ / ﻿20.11972°N 155.59333°W﻿ / 20.11972; -155.59333﻿ (Waipio Valley Road)) on the island of Hawai'i. As measured by Stephen Von Worley, the road has long sections that measure 30% with peak gradients much higher; some areas up to 39%. This is a paved public road but it is not a residential street and is open only to 4 wheel drive vehicles. Many streets in the west of England and in Wales have reported slopes of 33% and higher. The street Ffordd Pen Llech in Harlech, Wales has a reported slope of 36.6% (rounded to 40% on the warning sign). Vale Street in Bristol is often also reported as the steepest street in Britain (21.81°/40.02%) and hence may have a slope even steeper than 36.6%. However, these roads are mostly shorter roads than those listed above, with far more frequent turns as opposed to the straight path of Baldwin. ^ "Pupil wins gutbuster for third year in a row". Otago Daily Times. 17 February 1993. p. 3. ^ McNeilly, Hamish (13 March 2008). "Steep task no trouble for Gutbuster winner". Otago Daily Times. Retrieved 30 November 2008. ^ Owen, Pamela (19 September 2011). "The Gutbuster: Runners battle it out to race to the top of the world's steepest hill". Daily Mail. Retrieved 7 November 2013. ^ "Students used wheelie bin as sledge in tragic accident". The New Zealand Herald. 1 March 2001. Retrieved 11 September 2011. ^ "Stuntman conquers Baldwin St". Otago Daily Times. 2 January 2010. Retrieved 2 January 2010. ^ "Plaque marks Harry's pogo achievement". Otago Daily Times. 6 March 2018. Retrieved 10 September 2018. ^ Findlay, Grant; Small, Zane (10 January 2019). "Watch: Young man tackles Dunedin's Baldwin St on Lime scooter". Newshub. New Zealand. Retrieved 10 January 2019. ^ Satherley, Dan (10 January 2019). "Dunedin Mayor Dave Cull hopes 'common sense' will stop students riding Lime scooters down Baldwin Street". Newshub. New Zealand. Retrieved 10 January 2019. ^ Bob Batz, Jr. (30 January 2005). "Here: In Beechview". Pittsburgh Post-Gazette. Retrieved 11 August 2007. ^ "Pittsburgh Hills". Western Pennsylvania Wheelmen. Archived from the original on 16 May 2007. Retrieved 11 August 2007. ^ "A New Steepest Street is Born". The steep part of Bradford St is at 37°44′14″N 122°24′35″W﻿ / ﻿37.7373°N 122.4097°W﻿ / 37.7373; -122.4097. The rest of the street is around 25% grade, but the short piece is legit: 11.48 vertical feet in 30.9 ft of pavement, or 28.7 horizontal feet. That's measured in a straight line along the pavement; if you measure along the sort-of-centerline the grade is 39.6%. ^ Jennings, Ken. "Is This Hawaiian Street the World's Steepest Road? ", Conde Nast Traveler, 20 October 2014. Retrieved 18 May 2015. ^ Meierhans, Jennifer. "Where is England's Steepest Street? ", BBC News, 19 March 2017. Retrieved 19 March 2017. This page was last edited on 26 January 2019, at 13:22 (UTC).